Form some vegetables and herbs it is a shame to be dug up if you want to reap. You can better, each time you want to use some, harvesting a part of them and let the plant regrow. The (perennial) asparagus (Asparagus officinalis subsp. Officinalis) remains making shoots. They are harvested from the second Thursday of April to 24 June (St. John). Then the plant is left alone to let her collect power and grow. If you pluck rhubarb stalks (Rheum rhabarbarum) there are soon new again. Of celery you can always remove the outer leaves and stems. And that is actually the case with lettuce too. Even with cabbage. Not only the paler and softer heart is edible. Harvest and use always the oldest, outer leaves first. And leave a core of young leaves intact so that photosynthesis can continue. 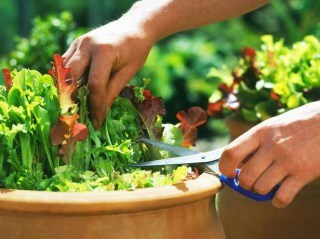 Most lettuces, sepecially loose-leaf varieties, you can use as pick and cut lettuce. Rocket (Eruca sativa) and radicchio (red chicory or radicchio rosso, Cichorium intybus var. Foliosum) are very suitable to regularly just picking the outer leaves, and keeping the center so that it continues to grow. Corn salad (Valeria locusta) is still another champion which even in winter makes your day. Never grub the whole plant, but just keep picking or cutting leaves. The leave of beetroot (Beta vulgaris subsp. Vulgaris var. Ruba) you can eat, especially when it is young. If you grown beets for the roots you should not harvest too much leaf of one plant. So you've got (more than) twice use of it. Sorrel (Rumex) is a perennial plant which in early spring can already be harvested. If you are preventing a central seed stalk gouging by regular cut, you can use it for a long time. Of endive (Cichorium endivia) (especially loose-leaf types) you can pick regularly. In extreme cases, it is sufficient that you let just a few shoots. It is therefore family of Belgian endive, which is completely grown according to this principle. Dandelion (Taraxacum officinale) you can continue to harvest thanks to its long taproot. He keeps coming back almost ineradicable. Mustard-leaf or leaf mustard (Brassica juncea) is actually a kind of cabbage, with leaves to use in fine dishes (salads or cooked). You can regularly pick the plant (partially) bare. Of kale (Brassica oleracea) a few leaves are sufficient to serve as a vegetable in a dish. And he remains growing quickly after picking, and will even defy the winter. Pak Choi (Brassica rapa var. Chinensis) looks like a cross between cabbage and chicory. Usually the crop is harvested, but you can also systematically, each time you want to use something, dismantle outer leaves. So you can have more and longer use of them. Many herbs have few problems with a regular haircut. Coriander (Coriandrum sativum) belongs to them, but also chives (Allium schoenoprasum), thyme (Thymus vulgaris), parsley (Petroselinum crispum), chervil (Anthriscus cerefolium). Basil (Ocimum basilicum) you can pick and cut carefree. The more tips you cut out, the more exuberant he grows. A champion in this species.